Parineeti Chopra Accused Of Not Having Seen Sholay After Thakur Oopsie. Is She Being Framed? Parineeti Chopra and Arjun Kapoor are filming Namaste England in Patiala and are having a lot of fun indeed! However, when on sets, Parineeti is particularly being troubled a lot by her co-star with the latest "accusation" being that Parineeti has not watched the cult classic Sholay. We'll tell you what happened actually. Parineeti posted an Instagram video from the sets of Namaste England, in which Arjun can be seen delivering Gabbar's iconic dialogue: "Yeh haath humko de de Thakur" with slight modifications. "Yeh AC mujhe de de Thakur," he tells Parineeti. Her response leads Arjun to suspect if she's ever watched Sholay or not - "Who's Thakur?" she says. All of this was in good humour, of course, and this is what Parineeti wrote while sharing the video: "Falsely accused of not watching Sholay. Baba is trying to frame me." Arjun was actually asking for the cooler for some respite from the Patiala heat and Parineeti knew just the way to dodge the request. LOL. Earlier this week, Parineeti Instagrammed another video about a personal challenge she's taken up against Arjun: "This video speaks for itself. I try this every day and fail miserably. Full body weight on him but he doesn't budge! As a result baba's arrogance is increasing. But very soon I'm gonna be successful and post that video," is what she wrote. 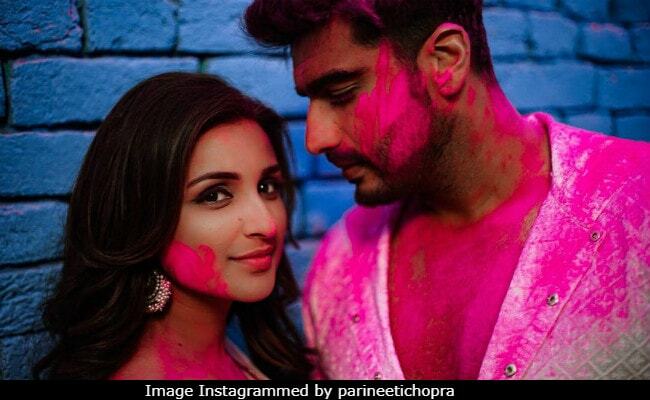 Parineeti Chopra and Arjun Kapoor are currently filming Namaste England in Punjab and will also be seen together in Sandeep Aur Pinky Faraar, which is directed by Dibakar Banerjee and releases on August 3. Directed by Vipul Amrutlal Shah, Namaste England releases on December 7.